In 1997 the Textile museum in Borås sent out an invitation to a joint embroidery. Threads and a needle together with a small piece of fabric were given to the ones who wanted to participate. This was the start of a long term embroidery correspondence between Linda Worbin and Louise M Jeppesen. The embroidery have been sent in between us living at different locations in Sweden – Borås, Stockholm, Landskrona, Malmö, Göteborg and Älmhult – and for the last years the embroidery also has been sent between Sweden and Denmark, when Louise moved to Copenhagen. 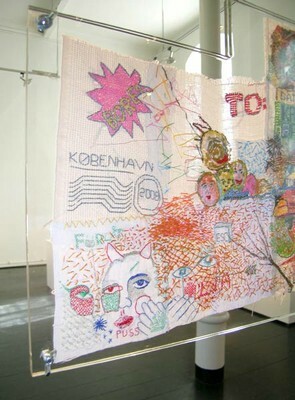 The correspondence embroidery has been the main inspiration for new pictures – some made together and others made individually – an these pictures will be exhibited at Ålgården 15-31 August 2008. 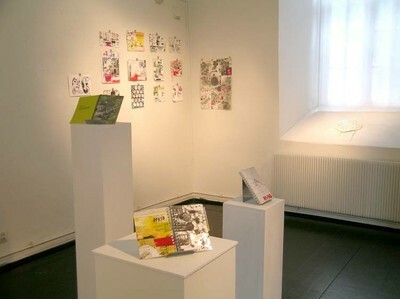 Louise M. Jeppesen is educated at Konstfack in Stockholm and has been working as a graphic designer and artist for the last ten years. Linda Worbin is a PhD student in textile- and interactiondesign.